Rusheen goes to Brooklyn School in Wellington. 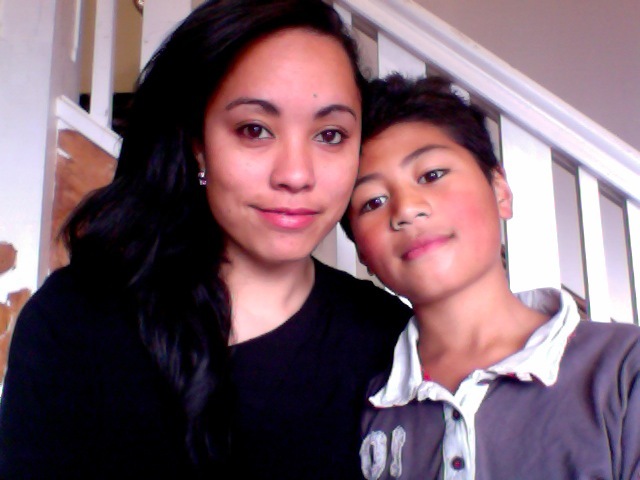 Courtney with her little brother, Pele (9), that she wrote the feather poem in the Treasury about. Courtney Sina Meredith started writing poems and songs when she was four years old, they were mostly about stars and ants. If she couldn’t be a writer she’d like to be a unicorn. Her passions include traveling, spending time with her smelly but adorable brothers in Auckland, and writing while eating ice cream – something she recommends to all budding wordsmiths. If you could meet one writer who you look up to, to discuss your own writing with, who would it be? What do you do when you are not inspired enough to write?/How do you get inspiration? I like to go for walks around the city while I work through my ideas, stopping somewhere for a coffee where I might pull out a notebook and scrawl down various notes! I have a little display of around 14 journals full of my adventures abroad, they are my greatest treasures, overflowing with joy and grief, pure boredom and scribbled maps. I’m inspired by people who stand up for what they believe in, in the same way I’m moved by the intricacies of nature. I think a writer is a filter, all of the world moves through you and you learn to work with the residue, what remains. If you could change one thing about your writing, would you and what would it be? As you change, the page changes too. A lot of young writers often ask me, ‘how do I become a great writer?’ this was especially true of some of the students I worked with across Java in Indonesia. My response is always the same ‘live a great life so you have something great to write about.’ The things I’d like to improve upon can only come with time and experience, I cringe when I look at some of the things I wrote when I was a teenager but I keep it all because every word, every letter has its place within the tapestry of who you are. What’s your favourite form of writing and why? Is it different to your favourite form of writing when you were in primary school? When I was at primary school I loved writing stories, especially ones with a surprise ending – like the mum ends up being an alien, or the whole house turns into a boat and sails away, but my favourite things to write were speeches. My first speech didn’t go very well, I was 7 and I’d written it all about my desk. The day before I recited it to the class, my teacher changed the room around, in my speech I talked a lot about the little pod of desks nearest to me but of course everything was rearranged by then so most of the class laughed at me and no one clapped! I went home determined to turn things around, I rewrote the speech and learned it off by heart, the next day I begged my teacher for a second chance and I got through to the school finals. Sometimes I perform the poems that I write so I guess in a way, not much has changed in terms of my first love. Do you ever have a mental block while writing? How do you overcome it? There’s a little trick I have, a strategy that I put into place in my late teens. I’ve always wanted to be a writer, right from when I was just a teeny tiny girl. I realised that I was going to have lots of days where I might not be able to write anything because of writer’s block. Around 18 I chose particular songs to write to, just a handful that completely resonate with me, songs I knew I could never outgrow. If I come up against a blank page and I just can’t see what comes next, I play those songs and I write myself through the block. This entry was posted in NZ Author, NZ Children's poetry, Poetry and tagged A Treasury of New Zealand Poems for Children, Courtney Sina Meredith, The Treasury Interviews on October 30, 2014 by Paula Green.